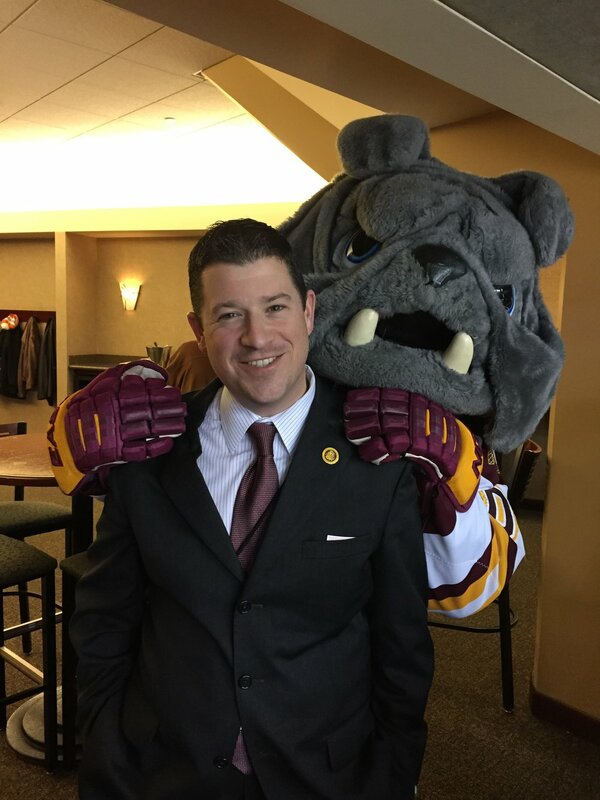 UMD Athletic Director Josh Berlo will highlight community engagement in UMD athletics and the value of sports in society. Photo by Ken Moran. 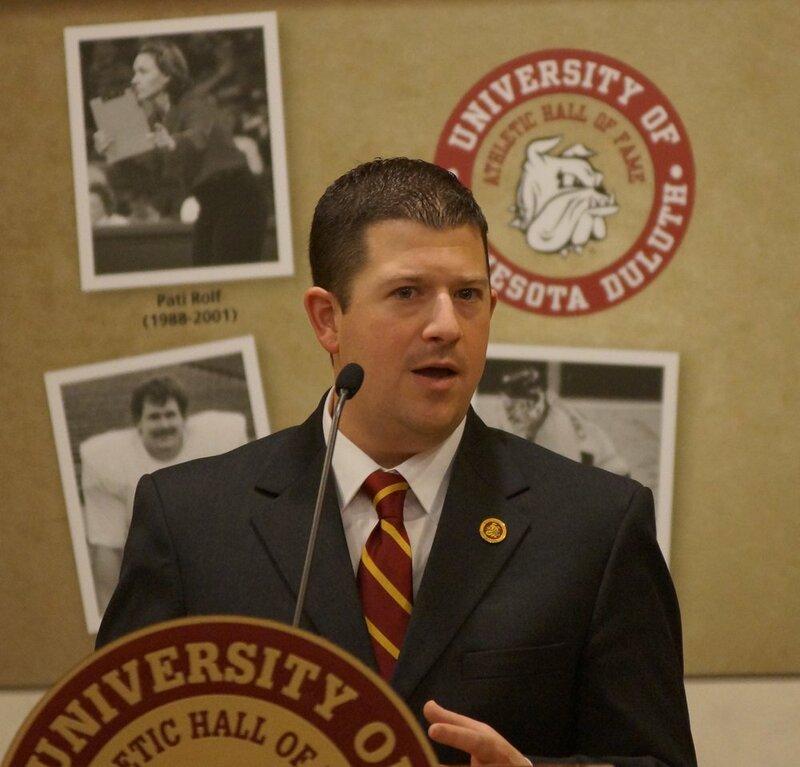 UMD Athletic Director Josh Berlo will be speaking about UMD athletics at the Hermantown Area Chamber of Commerce on Thursday, Oct. 26 at noon. Berlo said that he does a number of community presentations to local groups and business leaders with a focus on getting to know UMD athletics beyond the wins and losses. Now in his fifth season as the athletic director at UMD, Berlo’s “Why we play” presentation will highlight some of the community engagement that UMD athletic teams have done. One example of this is their partnership with the Laura MacArthur Elementary School in which athletes help mentor disadvantaged youth. Berlo said that student athletes are able to use their platform as role models and leaders to make a difference in the community. Berlo said that he uses opportunities to speak to the community to extend the conversation of sports to get to the core of what sports do for society, including how life lessons learned in athletics can transition to other careers and endeavors. His “Why we play” presentation will place great emphasis on teamwork, success, failure, and adversity. It’s fairly common to see community engagement in sports. Berlo said that he sees that others have also embraced the model of giving back to the community, as almost every NCAA championship and professional sports franchise has some kind of foundation that benefits the local community. One of Berlo’s favorite community engagement events at UMD is Kicks for Causes by the women’s soccer team. Each home game, one player from the team picks a local charitable organization to benefit, and then a booth is set up at the game to raise money and awareness for that cause. Kicks for Causes is one of many ways UMD athletes give back to the community, as UMD student-athletes and staff totalled over 3,000 volunteer hours during the 2016-17 school year, an all-time high. “Every opportunity when I’m talking about our athletes, it’s just a great opportunity to talk about what a special, amazing, successful place that UMD is,” Berlo said. Berlo’s wife is a cancer survivor, so the American Cancer Society is something that he says is very special to him. He serves on the state leadership board and he said that he tries to use athletics as a rallying point to find out what kind of good he can do for the organization. It’s just another part of how Berlo uses lessons learned in athletics to apply them to other aspects of life. UMD football prevails in horrid Thursday Night Football conditons against Bemidji St.